This photo was taken at the Marsh Madness at Goose Pond FWA in Linton, IN. 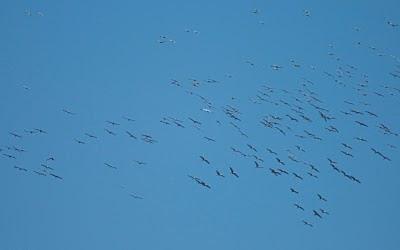 As Eric has already said there were thousands of Sandhill Cranes and one Whooping. Can you spot the Whooping Crane? Check our more great SkyWatch Friday posts here! Now, that's a sky full of birds!! How lovely! And what a terrific shot! Hope you have a wonderful weekend! I have no idea what a Whooping Crane looks like, but my guess would be the white one in the middle of the flock. Great shot! Nice flock!! Hope to see some of them here in eastern Ontario soon! Where's Waldo? I see a white one...is it Waldo? Ha, reminds me of photos I have taken after sunset of bats darkening the sky. ...amazing how he stands out. When enlarged, he's really white! It must have been a wonderful sight to see! Good capture of a flock of high fliers. Cool sighting and photo of the cranes. Is the whooping the white one? It is the only one that looks different to me.